Born within a volatile socio political landscape, Indonesian punk provides safety and a sense of identity to many who live day by day in crushing poverty. In Jakarta, the 12th largest city in the world (Karli 2014), it is estimated that 1 in 4 people live in Kampungs, local villages nestled in the dense city scape. These villages foster tight family like communities and are a self governing support structure for all who reside within the area. Elected heads of one particular Kampung were naturally skeptical of the heavily tattoo’d punk band Marjinal’s arrival, given Indonesia’s violent history towards anyone who looked spoke or acted in a way not supportive of the government. However the inspiring drive for creativity and unity made Marjinal an integral part of the community. 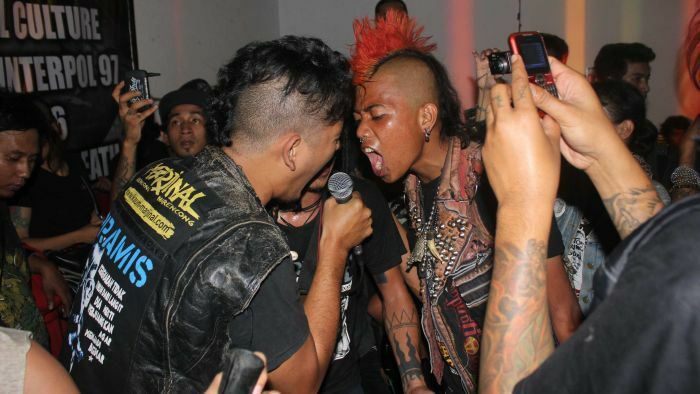 Indonesian punks have not always embodied the western image of punk, with ripped black jeans and piercings. The early indonesian punks embodied “true spirit of punk; anti-capitalist, anti authoritarian, autonomous, and independent” (Karli 2014). Marjinal band mates “Mike and Bobbi’s parents with their punk spirit and radical politics don’t look like punks. They belong to a generation where if you had tattoos you could’ve been killed” This reflection to a time in Indonesian history of government directed murder gives some indication to the landscape in which these people struggle. The Petrus Killings of President Suharto’s New Order in the early 1980s, involved covert, state sanctioned violent murder of suspected and convicted criminals. These bodies were then anonymously dumped in the streets and became a warning to those who defied the state order. Many victims of this atrocity were tattoo’d, forcing a public association between tattoo’s and criminality. This development of Indonesia into a heavily controlled military state referenced the anti Communist purges of the mid 1960s, in which over half a million people were murdered for their political views. This government corruption is what modern Indonesian punks still to this day strive to question. Through the support of otherwise outcast street kids, the punk scene lead by creatives and bands such as marginal seek to bring hope to a controlled corrupt cycle of life that is still rampant in modern Indonesia.